My training methods are creative, safe, fun, and effective. I believe in order to stick with an exercise program you have to enjoy it and get results at the same time. My interest for fitness started in 1985 and after raising three children I decided to pursue a career in it. I also believe that healthy eating goes hand in hand with an exercise program. 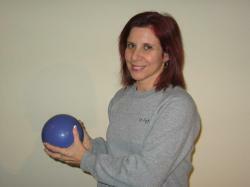 I offer motivational, fun, effective, fitness programs designed to your specific goals. I have trained both woman and men ages 13 to 82 at all fitness levels. So what are you waiting for, make the investment for a new healthy you!